We are so fortunate in the UK to have a network of children's centres which provide drop-in play groups and a host of activities, training, services and advice. I've written about them before fairly recently, but in case you missed that one, they were set up originally as an attempt to break the cycle of deprivation by modelling good interactions between adults and children in the hope that the children involved would go on to repeat the healthy behaviours they saw when they started their own families. If you live in a very affluent area you may therefore be less aware of these centres as they tend to be set up originally where there has been a greater need, either because the area is economically deprived or because it lacks other facilities such as good transport links or healthcare provision. The Hastings area had a rather shady history, including a riot way back, and I suspect that the transformation of the area into somewhere people want to be is at least in part down to the work of the staff and volunteers of the children's centres here. Even in the eight years we have lived here there have been big improvements including the gradual gentrification of our own street as new people have moved in and improved the upkeep of the houses. Despite the initial aim of tackling deprivation, there is no particular wealth class of people who use the centres. There is a real mixture of people from different backgrounds, all united by the one goal of trying hard for their kids. We go to a variety of activities including playgroups organised by children's centre staff, and a singing and signing group to help Toby's speech and language development which is run by volunteers. Today, as we are every time we go, we were blown away by the creativity and the huge amounts of preparation that the volunteers put in. The theme today was cars, with amazing large cardboard box cars having been produced by one of the volunteer's sons. The simple addition of Velcro strips enabled the children of all ability levels to quickly 'build' a car by adding wheels and lights. 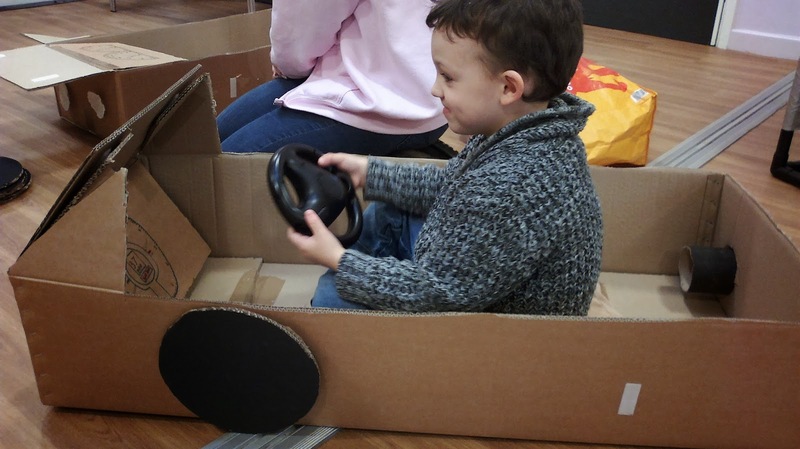 Other themed activities included making their own shoebox car to take away home, and playing with toy cars and garages. At the end of each session there is singing with Makaton signing, a book is read with signs - today it was a 'guess what it is' lift the flaps book - and there is a 'what's in the bag' song where each child picks a mystery object out of a big bag and we all learn the sign for it. I learned 'dumper truck' today which with two small boys is a useful one to know. The skills taught are lovely, the obvious one being the signing, but also social skills such as taking turns and working together. Because this is quite a small group I find it less exhausting than some of the really busy noisy groups and I'm sure this must be the case for the children too. This fortnightly group is Ollie's favourite one and he asks most days if we can go 'today'. Giving Toby extra communication tools definitely lessened his frustration too, resulting in Ollie getting bitten far less. Through the children's centres I am starting free Makaton training myself this week, made possible as with so many of the courses by the provision of a no-cost crèche. If you have never been to a children's centre activity before, or have been to a couple of sessions and not liked it, I would definitely recommend looking again at what is available in your area. There are so many different groups running, with different sizes, organisation and target audiences that there is bound to be something that suits your own circumstances. If there isn't, ask for it. Have you got twins and are struggling to manage at playgroup on your own with two little ones? Does your child have a specific requirement such as needing time in a sensory room environment? Is your child really shy and requires a calm quiet group? Tell someone - there may already be a group available, or volunteers willing to set up a new one. Each centre will have staff or volunteers on hand to talk to, and comments slips which you can fill out. Even if you are really shy yourself, and don't want to go alone to a new group, many centres run 'buddy' services and will pair you up with a volunteer to go in with you. With all the budget cuts and reductions in public spending, if we want these services to remain available we have to support them with our presence. If nothing else, they are a great place to go to 'steal' crafty ideas from the supermums and trained staff and volunteers there. I think the cardboard box cars activity from today will be featuring heavily in our play for the next few weeks!